Before calling or emailing, see our Frequently Asked Questions page under "Parents." DE Turf will be on the left but you must continue straight for 3.3 miles and take the Thompsonville Rd. exit. Make an immediate left and exit onto DE-1 N. DE Turf will be on the right. Take I-95 S toward Wilmington. Take exit 4A to merge onto DE-1 S for 54 miles. Take 13 N through the Chesapeake Bay Bridge Tunnel. Stay on 13 N for 92 miles. Turn right onto US-113 N. Continue on US-113 N for 74 miles. Take the ramp onto DE-1 N/Bay Rd. Drive 5 miles on DE-1. 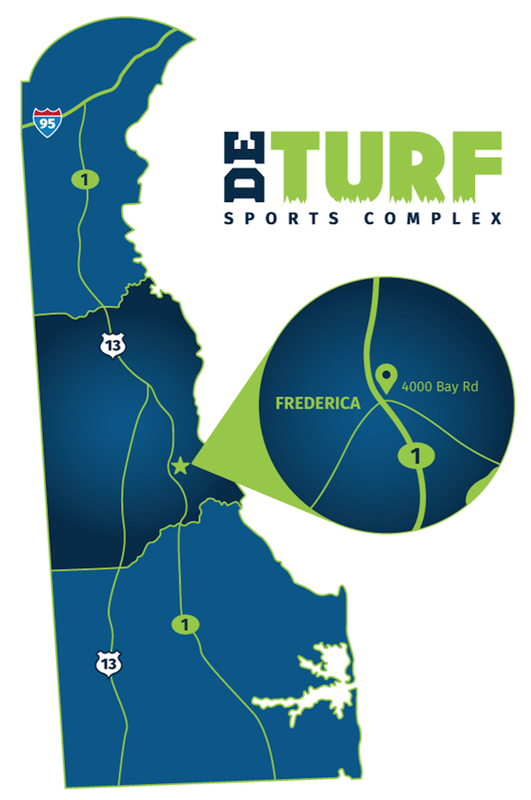 DE Turf will be on your right. Take US-50 E for 67 miles to MD-19 E. Follow MD-19 E for 30 miles to DE-1 S in Kent County from Cypress Street.